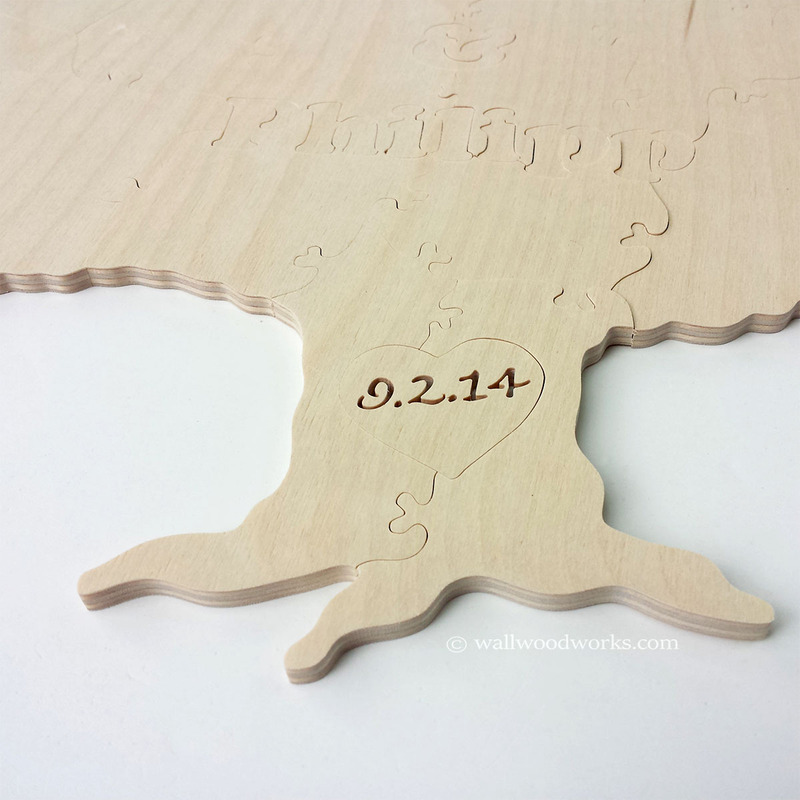 A tree wedding guest book puzzle is styled and designed after the growth tree. It is also shows the natural wood grain on the front so when you finally decide to frame it you can see all of the signatures! Select from 10 to 220 sign-able pieces. 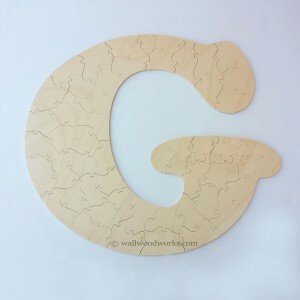 The recommended amount of sign-able pieces that you need for your tree guest book puzzle is based upon the number of guests you have attending your event. Events could be weddings, birthdays, or anniversaries. Typically I recommend 70-80% of the total guest count. This is because most of the times couples sign together, children do not sign, and single people sign for themselves. Some past clients have even just ordered one piece per guest for sheer entertainment. Your two names in the center of the tree. The date in the center of the tree. Two names in the center with the date within a heart of the tree. Other – Choose your own tree wedding guest book puzzle layout! 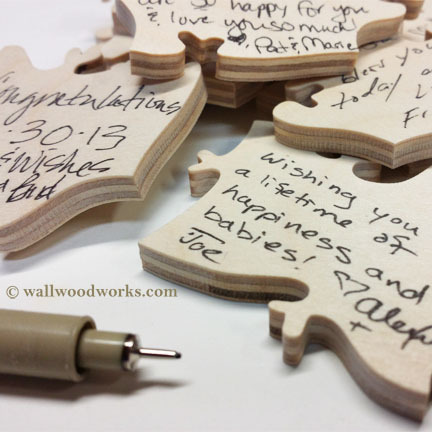 Select the number of pens you would like included with your tree wedding guest book puzzle. The first pen is free. We recommend one pen for every 25 or so guests. We currently only stock black pens. 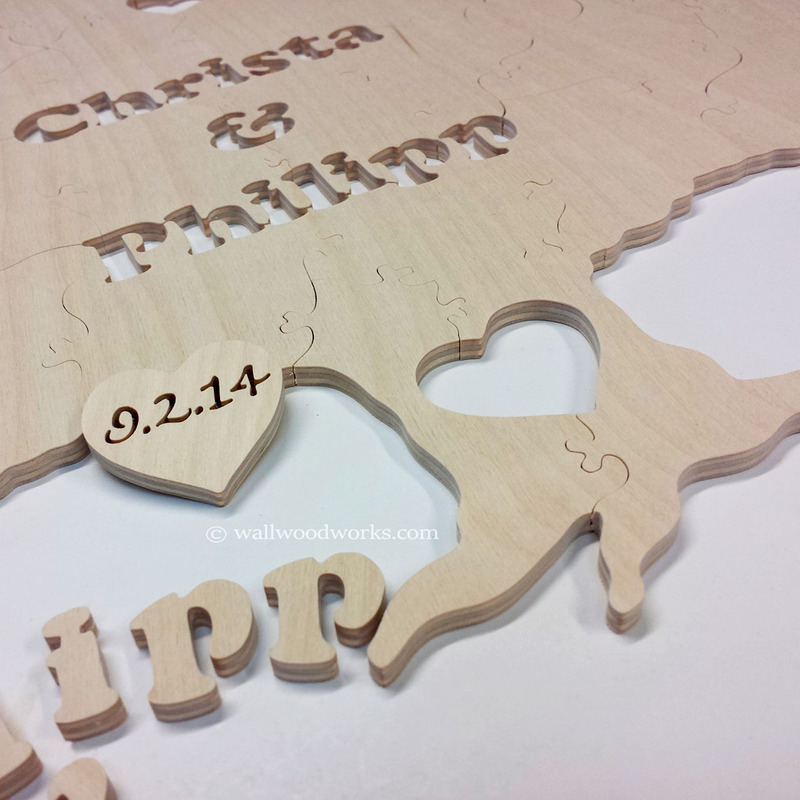 Select the type of sign you would like to be included with your tree wedding guest book puzzle. There are two type of signs that are available. A basic square sign is included with the puzzle and has a message so your guests know to sign a piece. The premium sign is much larger and more decorative. You also have the option of having the premium sign engraved with your two names. By default “Sign Other Side” will be stamped on the back of every piece so guests know which side to sign and no signatures are lost when the tree wedding guest book puzzle is framed. This is matter of preference, some of our past clients prefer it some do not. If you do not want stamping enter NO STAMPING with in the details box. 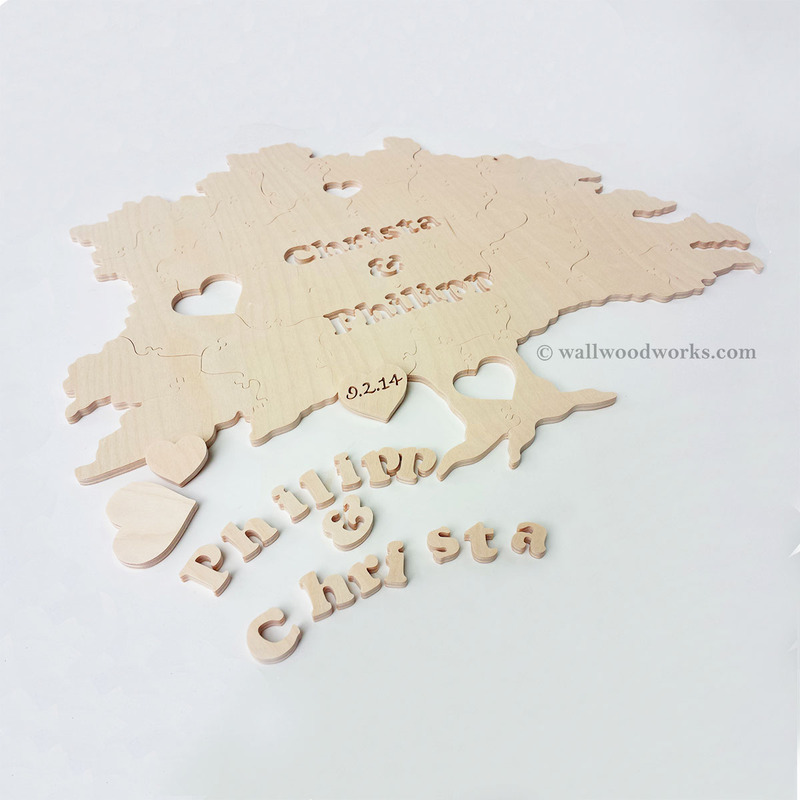 Each piece of tree wedding guest book puzzle is much larger than normal wood jigsaw puzzles pieces at roughly 1.50″-2.5″ square. This is so guests can sign the back of the puzzle piece and leave a message. Puzzle size is based upon that number, which can vary from that number. 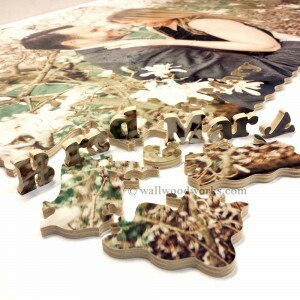 The puzzle was just as I expected and as shown in the photos. Beautiful, well-made, and precisely cut. I received many compliments. Item looks great and it was shipped very quickly! I received my puzzle today and it is PERFECT! Very high quality, the shop is super easy to work with and they are very responsive. Thank you! My fiancé & I were absolutely amazed & love, love, love our puzzle!! We cannot wait to share it with our guests at our wedding! Also, Jason was very quick to respond to any questions or concerns that I had. My fiancé & I were absolutely amazed & love, love, love our puzzle!! We cannot wait to share it with our guests at our wedding! Also, Jason was very quick to respond to any questions or concerns that I had. I would order from this shop again! In love with the puzzle! Unbelievably fast delivery! My wife absolutely loved this wedding guest book puzzle. Thanks Jason!! As advertised and quick shipping! This was an AMAZING purchase. such a beautiful and sentimental touch that will be added on my special day in October. Jason is a great person and pleasure to deal with. he responds to any and all questions and concerns and being that I'm generally a nervous person he was able to put my worries aside. I look at many similar products and merchants and checked reviews and after my research i decide to contact Jason we spoke a few times before i even placed my order and he always answered quickly and was very detailed and patient with me. Once i placed my order even with my custom design and small detailed changes my order was delivered quick. with every step Jason communicated with me and sent me layout before any production took place. Once I received the finished product i had to put it together right away i was blown away. 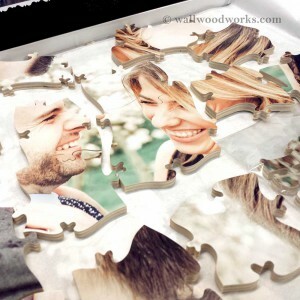 Very lovely craftsmanship, beautiful puzzle, just hard to put together!